"Beast of No Nation" is the story of Agu a child-soldier whose narrative has a lot in common with Birahima's in "Allah is not Obliged", both narrators not older than ten were unable to tell their ordeal in a grammatical correct language, nevertheless it was no deterrent to put their message across. However, let me confess it somewhat slowed down my reading as they were both children narrating atrocities in an unstructured language which makes it necessary to reread sometimes. fled on time with his sister, his father is murdered in front of him and he ends up being recruited as a child soldier. 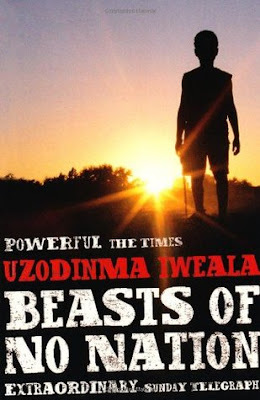 This novel is rather a diary entry of his ordeal as a child soldier, the sexual and physical abuse inflicted on him and the ones he is forced to inflict on others. Did I enjoy the novel? Not as much as I thought I would, I guess it is because (unfortunately) I have read more interesting and well elaborated narratives on child soldiers, for example Allah Is Not Obliged, A Long Way Gone or the non-fiction They Poured Fire on Us From the Sky If you'd like to see other books I have read on this topic please click here. However, if you are going to see Beast of No Nation the film, I'd recommend you read the book first. Yeah, I had the same issue you did with the book except that I hadn't read other child soldier tales yet. I love the movie a lot. It's different but still really good. To me it does not read as a fully elaborated novel..... I have not seen the.movie yet. I hope to see it soon.